Studio Jules Art - Blog: Where Has the Time Gone! What a busy year I am having! So busy that I think about blogging and then in the evening I’m too tired to think, much less make sense in a blog post. So, I told my self last night, blog in the mornings while you are having your first glass of green tea. Perfect. What has kept me so busy you ask? Besides the normal caregiving duties with Mr. Wonderful, I have revised my “To Do” list a couple of times. The marker board in my studio has gone from listing shows to enter to a list of things to get accomplished, because the list keeps growing and I can’t keep up. 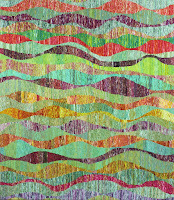 In April, the Dallas Area Fiber Artists had their annual show. 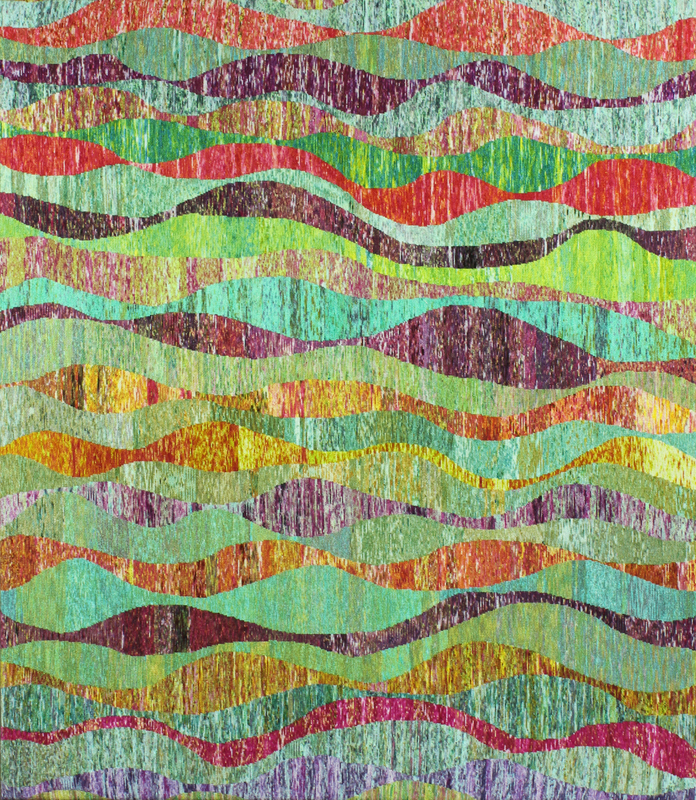 My petit-point piece, Waves of Color, came in Third Place. The other exciting news is that my piece, Reflections in the Sea, sold! Last month, I entered, and was accepted into, a SAQA Regional show in Abilene, TX. 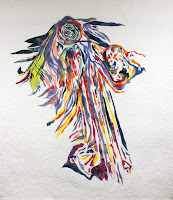 Texas Quilts: Art in Stitch. Very excited about this show. 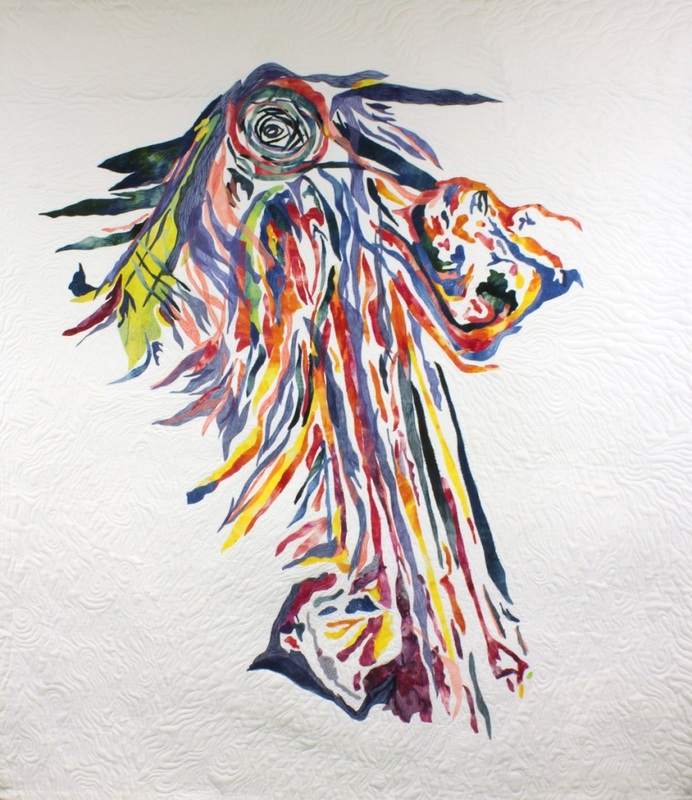 The quilt that will be showing is Angel of Mercy.
. Last year they had caregivers write on muslin blocks with the idea of a quilt. Well, it turned into 13 smaller quilts to be hung in their exam rooms and hallway. As if I don’t have enough to do, I decided to start teaching beginning quilting classes from the house. This way I can share my love for quilting and also be here to care for Mr. Wonderful. These ladies Rock! And we have so much fun. Right now they just have one more class and then we are going to start a Sampler Class. I’m almost done with my sample quilt and have had a great time deciding what blocks they are going to make. I’m also writing curriculum for a “Quilt as You Go” class and have bought a couple of patterns of Modern Quilts to teach. In a week I am having my first Dye Workshop and the class is full! We are going to try various ways of dyeing, such as gradient, ice dyeing, traditional dyeing, and Shibori. It should be a fun day and people that are coming are from various groups I am involved in and neighbors. I’m looking forward to posting pictures after the class. Okay, I think I have caught you up on my busy schedule and I am going to make more of an effort to blog in the mornings before life gets me too tired to make sense! There is so much to tell you, but I’ll save some of it for future posts. Don't forget, if you are trying to keep up with me a little more often than my blog posts, follow Studio Jules Art on Instagram, Twitter and Facebook. I can usually take a quick picture and post a few times a week!